Wouldn’t it be fun to make ALL the vintage potholders? They would look so beautiful together. There are a lot of potholders that are similar to one another. This Christmas Tree Potholder is very different. It is so stunning!!! 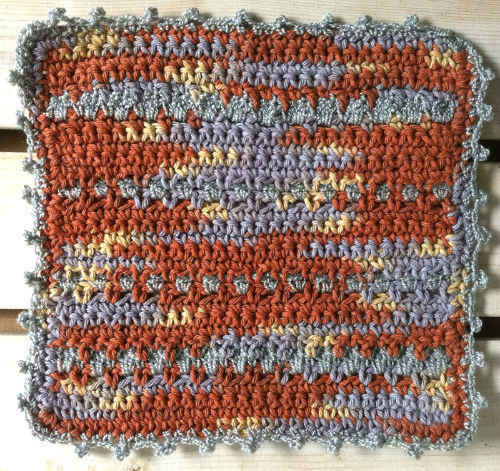 This is one potholder you do not want to miss in your collection. 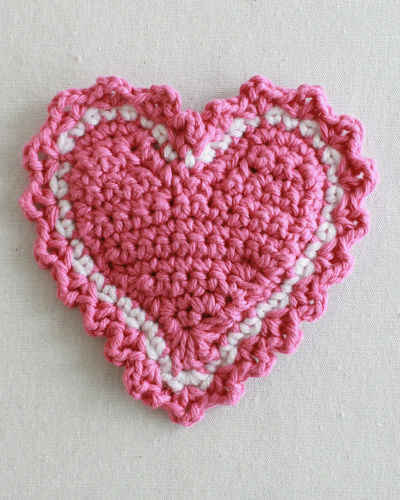 Crochet this design with our easy to follow pattern and crochet cotton thread. Materials: Size 10 Crochet Thread: Green and White; 6-Strand Embroidery Cotton: 5 Assorted colors. Bone Ring – ½ inch diameter. Row 1: (Right Side) With Green, ch 66, sc in 2nd ch from hook, sc in next 31 ch, 3 sc in next ch, sc in next 32 ch. Row 2: Ch 1, turn, working in back loops only, sc in first sc, sc in next 32 sc, 3 sc in next sc, sc in next 33 sc. Row 3: Ch 1, turn, working in back loops only, sc in first sc, sc in next 33 sc, 3 sc in next sc, sc in next 34 sc. Rows 4-6: Ch 1, turn, working in back loops only, sc in each sc across, working 3 sc in center sc of each row. Row 7: Ch 1, turn, sl st in next 5 sc, working in back loops only, sc in next 33 sc, 3 sc in next sc, sc in next 33 sts. Row 8: Rep Row 3. Finish off Green and weave in ends. Row 9: With right side facing, working in both loops, join White with sc to first sc, sc in next sc, * sc in base of next st of previous row, skip the st in back of sc just made, hdc in base of next corresponding st of row below, skip the st in back of hdc just made, sc in base of next corresponding st of last row, skip the st in back of sc just made, sc in next 2 sc; rep from * 5 times, sc in next 3 sc, 3 sc in next sc, sc in next 5 sc, * sc in base of next sc of last row, skip the st in back of sc just made, hdc in corresponding st of row below, skip the st in back of hdc just made, sc in base of next st of last row, skip the st in back of st just made, sc in each of the next 2 sc; rept from * 5 times. (6 patterns on each side) Finish off and weave in ends. Row 10: With right side facing, working in back loops only, join Green with sc to first sc, sc in each sc across, working 3 sc in center st. Rows 11-14: Ch 1, turn, working in back loops only, 2 sc in first sc, sc in next sc across to last sc, working 3 sc in center st, 2 sc in last sc. Rows 15-16: Ch 1, turn, working in back loops only, sc in each sc across, working 3 sc in center sc of each row. Row 17: Ch 1, turn, sl st in next 9 sc, working in back loops only, sc in next 38 sc, 3 sc in next sc, sc in next 38 sts. Row 18: Ch 1, turn, working in back loops only, sc in each sc across, working 3 sc in center sc of each row. (81 sc) Finish off and weave in ends. Row 19: With right side facing, working in both loops, join White with sc to first sc, sc in next sc, * sc in base of next st of previous row, skip the st in back of sc just made, hdc in base of next corresponding st of row below, skip the st in back of hdc just made, sc in base of next corresponding st of last row, skip the st in back of sc just made, sc in next 2 sc; rep from * 5 times, sc in next 3 sc, 3 sc in next sc, sc in next 5 sc, * sc in base of next sc of last row, skip the st in back of sc just made, hdc in corresponding st of row below, skip the st in back of hdc just made, sc in base of next st of last row, skip the st in back of st just made, sc in each of the next 2 sc; rept from * 5 times. (7 patterns on each side) Finish off and weave in ends. Row 27: Ch 1, turn, sl st in next 14 sc, working in back loops only, sc in next 38 sc, 3 sc in next sc, sc in next 38 sts. Rows 28-29: Rep Rows 18-19. Row 47: Ch 1, turn, sl st in next 20 sc, working in back loops only, sc in next 32 sc, 3 sc in next sc, sc in next 32 sts. Row 48-49: Ch 1, turn, working in back loops only, sc in each sc across, working 3 sc in center sc of each row. Finish off and weave in ends. Row 1: With right side facing, join Green with sc in 6th sc from center sc of lower edge, working in both loops throughout, sc in next sc, hdc in next 2 sc, dc in next 2 sc, tr in center sc, dc in next 2 sc, hdc in next 2 sc, sc in next 2 sc. Rows 2-11: Ch 1, turn, sc in each st across. At the end of Row 11, finish off and weave in ends. Repeat as for Tree Front, reversing the colors except the Trunk. Rnd 1: With wrong sides together and right side of Front facing, matching Front and Back, working through both thicknesses, join White with sc to first st of last row, work in pattern st (same as Row 9) across the top and all branches facing upward, work a picot at each point, work in sc when working downward between the branches and across lower edge and around trunk. Finish off and weave in ends. ng; join with sl st to first sc. Rnd 2: * Ch 6, sl st in 2nd ch from hook, sc in next ch, hdc in next ch, dc in next 2 ch, skip next 3 sc on ring, sl st in next 2 sc on ring; rep from * 4 times, ending last point with skip next 3 sc on ring, sl st in next sc on ring. Finish off and weave in ends. 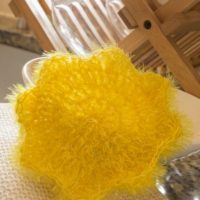 – Sew to top of potholder (use photo as guide). TREE ORNAMENTS (Make 24 in various colors)Rnd 1: Using Embroidery Cotton, ch 2, 8 sc in 2nd ch from hook; join with sl st to first sc. – Sew to Front of potholder (use photo as guide). 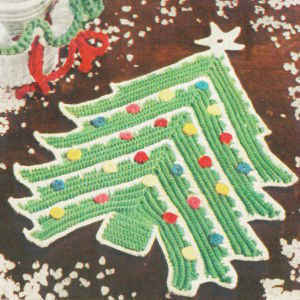 I would like to make this in Yarn ,would I just 1/2 the beginning stitchesand through out the pattern? I will try it tonight with yarn as I love the pattern but I preferr yarn to thread as the old eyes aren’t what they use to be. Peggy Failing,Pa.